How to recover deleted Line chat history on an iPhone given that the smartphone is capable of losing chat histories due to a technical glitch or the user's fault? Is it possible to recover Line chat history on iPhone? Fortunately, it is possible to get back the deleted Line history from an iPhone using the mentioned recovery application. iBeesoft iPhone Data Recovery tool is a powerful application and the best choice when it comes to recovering data from an iPhone (including the latest models). In addition to the phone, the app is capable of retrieving data from iPad, iPad Touch, iPod, and iPod Touch. the best Line chat history recovery iPhone tool is capable of recovering lost or deleted chat history and other data irrespective of the scenario under which there was a data loss. 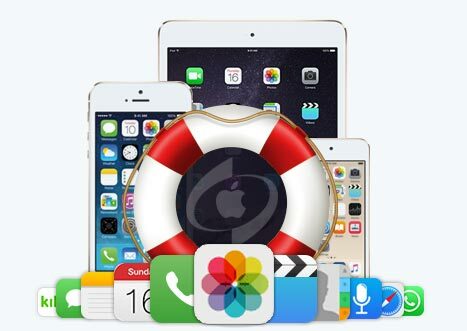 Recover Line chat history iPhone using this data recovery software in a few simple steps. The Line app is trending across the globe for it offers excellent communication features along with enhanced convenience. The application allows users to exchange messages, share photos and videos, and more. However, much like any other app on a smartphone, Line is also prone to data loss at times. Furthermore, there are occasions where users delete history mistakenly. It Supports recover over 50 different file formats, like pictures, videos, snapchat messages, contacts, calendar, bookmarks, WhatsApp/Kik messages, notes and more. The Line chat history recovery iPhone tool supported all models of iPhone along with iPad and iPod touch. 1. Install the iPhone data recovery software from the iBeesoft official site. It is a reliable and standalone application. 2. Establish a connection between the iPhone and the system using the data cable. Launch the recover line chat history iPhone application. The program detects the connected device automatically. From the primary window, choose "Recover from iOS device". If the program does not detect the device, then ensure to enable the "Trust this computer" feature on the phone and input the password. Once the device is visible, proceed by clicking the "Scan" button to recover deleted Line messages on iPhone. 3. iBeesoft takes a few minutes to retrieve the deleted content. It will arrange them according to the file format. For instance, all videos will be under the videos section regardless of the source. One can view this on the left partition of the window. From here, one can choose the Line chat history, including messages, photos, and videos, select the required files and press the "Recover" button. The software will ask for a path to store the files. Choose a folder on the computer and wait until the process is complete. The following steps help recover deleted Line messages on iPhone. this options can also extract contacts from iCloud. 1. Open the iBeesoft program and click on "Recover from iCloud" option. In the same window, input iCloud user ID and password to gain access to the recent backup file. Remember that the application does not store the login credentials. It only allows you to select the needed backup file and extract files. 2. After completing the login, iBeesoft will display the backup files on the screen. One can select the recent backup files that consist of Line chat history. The program will download the selected backup file. 3. After completion of the download, the program will extract the contents and segregate according to the file formats. One can now select the needed files from the left side of the window and press "Recover" to save the Line chat history on the computer. iTunes also provides the option to create backup files on an iPhone device. With the help of the best free iPhone data recovery, one can recover iPhone Line chat history in a few simple steps. 1. 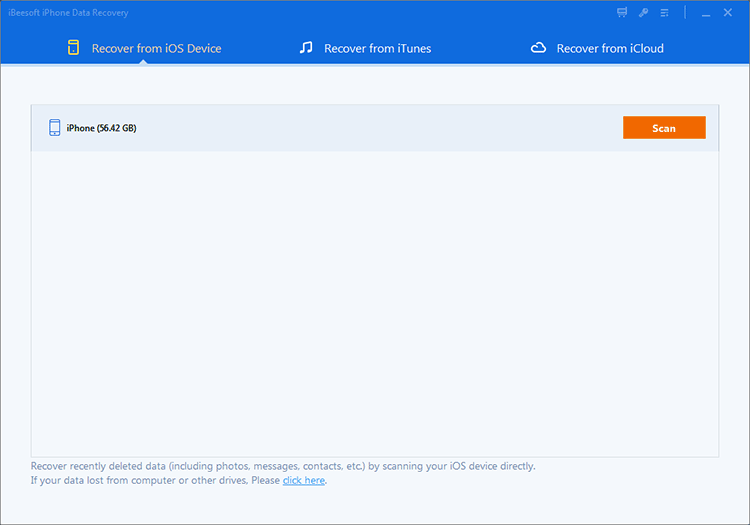 Launch iBeesoft Data Recovery program and click on the "Recover from iTunes" option. The recovery application will perform background scanning and display the available iTunes backup files. 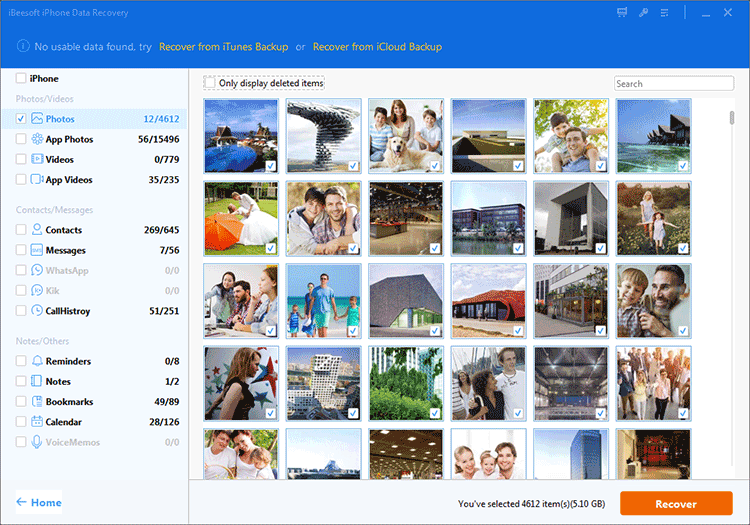 If there are backup files, it is preferable to choose the latest or the recent backup file, as it contains the updated or deleted Line chat history. 2. After selecting the preferred backup file, click the "Scan" button to recover deleted Line messages on iPhone. It will begin extracting the content from the selected iTunes backup file. 3. After completion, iBeesoft will arrange the recovered files according to the file formats. To the left side of the screen is the tree directory that assists in maneuvering across the recover data with preview. From here, users can select messages, photos, videos, documents, and audio files shared using the Line application. 4. 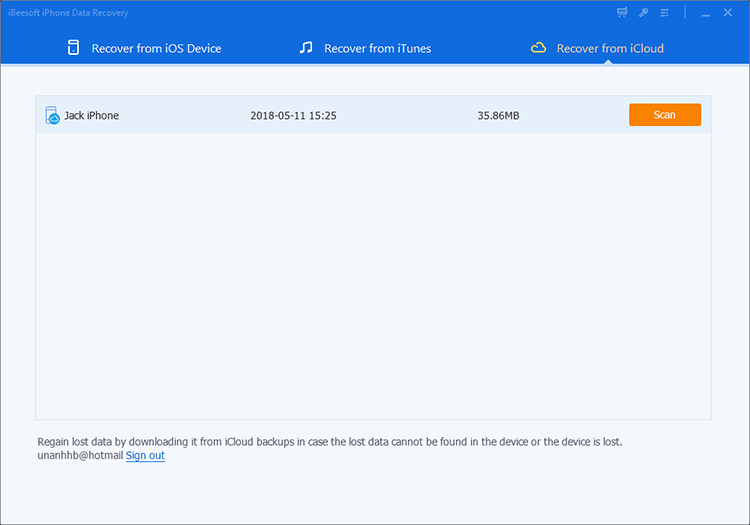 After completing with the selection process, users can click "Recover" button at the bottom to retrieve the selected files from the iTunes backup file onto the computer. The program will ask for a folder or a destination on the computer before beginning the extraction. The completion of the extraction process depends upon the amount of data selected.